Yesterday was a dramatic day at Dalal Street. The day started normally. After the early morning ablutions, the punters had lined up outside Shyam’s Tea Stall sipping kadak adrak chai and munching Gutka. There was excited chatter about what stocks to punt on. Suddenly, Ashish Kacholia appeared unannounced. Normally, Kacholia has a distinguished and calm demeanour. However, he now appeared distraught and anxious. “Kisiko Vadilal Industries ka share chaiye kya?” he asked some punters loitering around. “10% kat ke le lo,” he said, his eyes pleading. “20% discount mein dete ho to bolo,” a boyish looking punter replied, trying to take advantage of the situation. To everyone’s surprise, Kacholia meekly handed over his massive consignment of 362,305 shares representing 5% of Vadilal’s equity without batting an eyelid. Naturally, the stock plunged like a stone and tripped the lower circuit of 20%. Nowadays, Porinju is preoccupied with the Kerala flood rescue efforts. He is spearheading the mobilization of funds and resources and inspiring his legion of 1.1 Million (11 lakh) followers to contribute their mite towards the noble cause. However, no matter what the preoccupation may be, Porinju always keeps an eye on Dalal Street. When he saw Vadilal Industries sinking, he rushed in and bought a chunk of 48,000 shares at Rs. 590.24 each. Porinju’s valiant efforts were not enough to save the stock from hitting the lower circuit. However, it helped to some extent to soothe sentiments and prevent panic amongst Vadilal Industries’ hapless shareholders. Today also, Ashish Kacholia landed at Dalal Street and dumped a chunk of 142,527 shares. This sent the stock price spiraling downwards. However, thereafter, some unknown entity launched an aggressive buying action to neutralize Kacholia’s selling action. The stock was flat by the EOD. Why did Ashish Kacholia unceremoniously dump Vadilal Industries? Ashish Kacholia had earlier aggressively bought Vadilal Industries. He bought the first tranche of 341,409 shares (including 110,279 shares in the name of Sushmita Ashish Kacholia) in the June 2015 quarter. This was increased to 3,81,183 shares as of 31st March 2017. The holding swelled to 5,18,432 shares as of 30th June 2018, representing 7.21% of the total equity. According to some punters who investigated the matter, Ashish Kacholia appears to have been spooked by the unending dispute between the promoters of the Company. 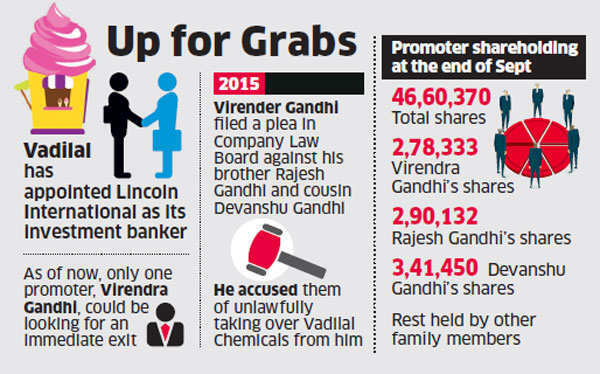 The ET reported in December 2015, that Virendra Gandhi is bitterly opposed to Rajesh and Devanshu, his brother and cousin respectively, and has alleged that the duo have connived to oust him from the post of CMD and to take over the Company. 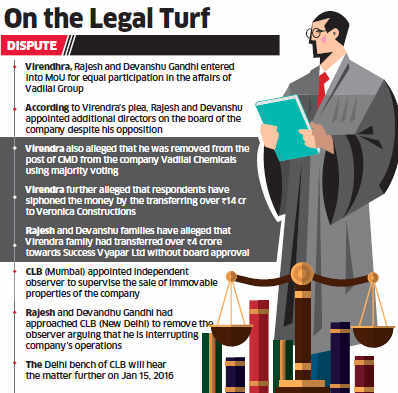 “Vadilal business faces meltdown as Gandhis battle for control in CLB,” the headline stated in a dramatic manner. Later, in August 2017, VCC reported that the warring promoters have decided to settle the family feud out of court. The ET reported further in November 2017 that the promoters are planning to sell their holding of 65% and exit the Company. Naturally, this sparked speculation that a deep-pocketed MNC like Häagen-Dazs, HUL or Nestle would take over the Company and offer a buy-back to the minority shareholders. However, nothing tangible has emerged so far and this may have frustrated Ashish Kacholia. Ashish Chugh was the first discoverer of Vadilal’s potential to give multibagger returns. In July 2012, when the Company was still an unknown minnow, he recommended a buy. 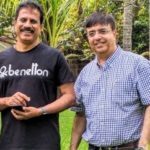 Porinju recommended a buy of Vadilal Industries in May 2015 during the crisis in Greece when all stocks had plunged amidst fears that the Country would go bankrupt and cause colossal losses to the World. Thankfully, nothing of that sort happened. Instead, the crisis blew itself over and was soon forgotten. In fact, Porinju had recommended three stocks during the Greece crises, namely, DCM, Balaji Amines and Vadilal Industries. Each delivered magnificent multibagger gains. Wow..Vadilal at new historic high! What about the balance shares held by Ashish Kacholia? It is obvious from the events of the past two days that Kacholia is in no mood to hold on to his shares in Vadilal Industries. Out of his holding of 5,18,432 shares as of 30th June, 5,04,832 have already been sold. We can expect him to dump the balance 13,600 shares as well over the next few days. Should we dive into the stock? Novices normally rush in where angels fear to tread. We then complain of burnt fingers. This time, it is better if we tread with caution because Kacholia may know something sinister that the rest of the World is unaware of. We can take a decision one way or the other after the September 2018 quarterly results are announced! I am huge fan of Ashish, Porinju, Shyam, Anil Kumar, Vijay Kedia, Ashish Chug and Dolly. These are unsung heros in investing world. I think Basant Maheswari is also in the same league no? In my view Investment style of Basant maheswari and Dolly khana is good, While Basant looks into good quality stocks with high growth even with paying higher price for growth, but Dolly khana see both reasonably priced with reasonable growth. One can find path in between these two with 20% CAGR growth of leadership stocks with PE Upto or below 30.I invest with large Blue chips leadership stocks with double digit growth mostly between 10 to 20 CAGR and ready to pay market price in scattered buying to avg out price. Key is to find out what has happened to the legal issue under CLB ambit? No discussion on that in this article. Prima facie it appears that a company always operates on majority voting, so if the CMD has been replaced through that, very little the ex CMD can do. However, if the new CMD and ED have done wrongs (like siphoning off funds), the ex CMD has the right to pursue his complaints and can even take the matter to SEBI, stock exchanges, investigation agency etc. If ex CMD exits, and if a good existing company in this business line buys that, along with further open market acquisition, the share price will recover/rise. Till then, it may be downhill. BTW, this company makes money only in one quarter (June) every year. Looking at its operating performance, it is highly overpriced, a good reason for Ashish to exit. Dont know what Porinju is looking at! Maybe there is a small recovery from the current oversold position, but in the medium/long term, this is headed south. Promoter/management stability is, after all, a key factor for a company to perform. Company only started showing profits from 2016, before that the Chor promoters were just siphoning of money. Only when internal tussle between promoters revealed their fraudulent transactions in 2015, they stopped. How can anyone trust such Chor promoters with their hard earned money!